1. Cut an A2 sized (8 ½” x 5 ½”) card base out of yellow cardstock and fold in half. 2. 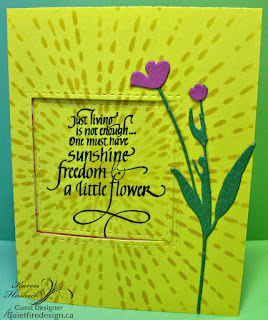 Using temporary tape, attach the folded card to a craft mat and tape down the sunshine stencil from The Crafter’s Workshop over the card. Sponge Mustard Seed Distress Ink through the stencil holes, then remove the stencil. 3. Die cut a stitched square with a Lil’ Inker die out of the middle left of the card front and stamp the “Just Living” sentiment in the center of the cut out stitched square. 4. Cut a piece of floral designer paper (mine was from The Paper Studio) 5 inches by 7 ½ inches and score at 2 ½” and 5” on the long side. 5. 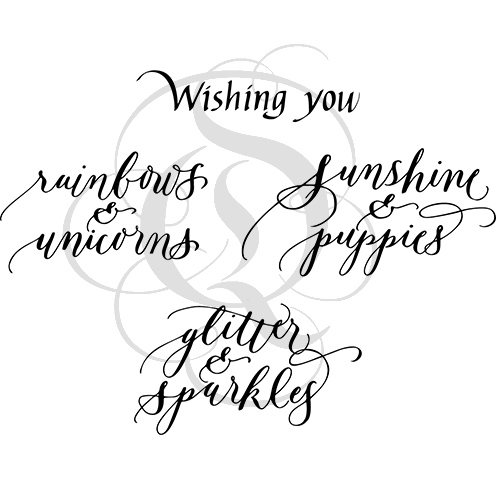 Stamp “Wishing You” from the WishingYou Whimsy stamp set on the left third towards the top. 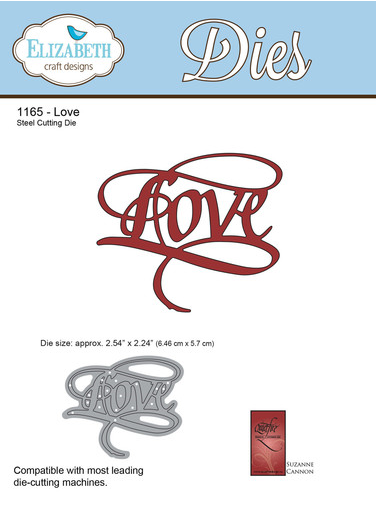 Die cut and attach “Love” below it. 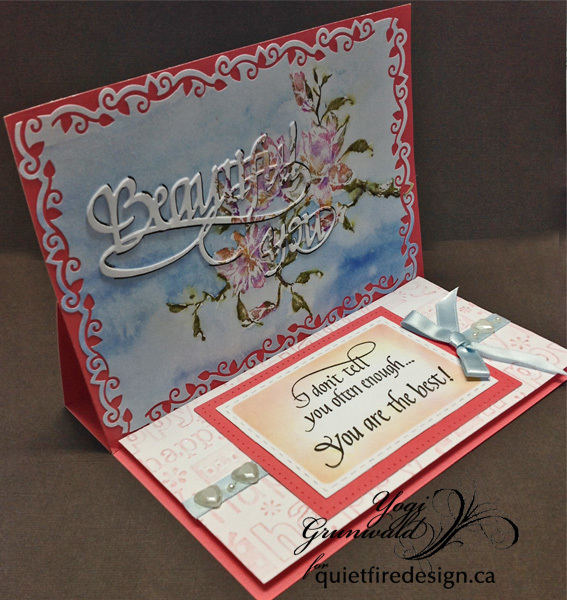 I had to trim just a bit of the swirls on the Quietfire Designs “Love” so it fit on the folded piece. 6. 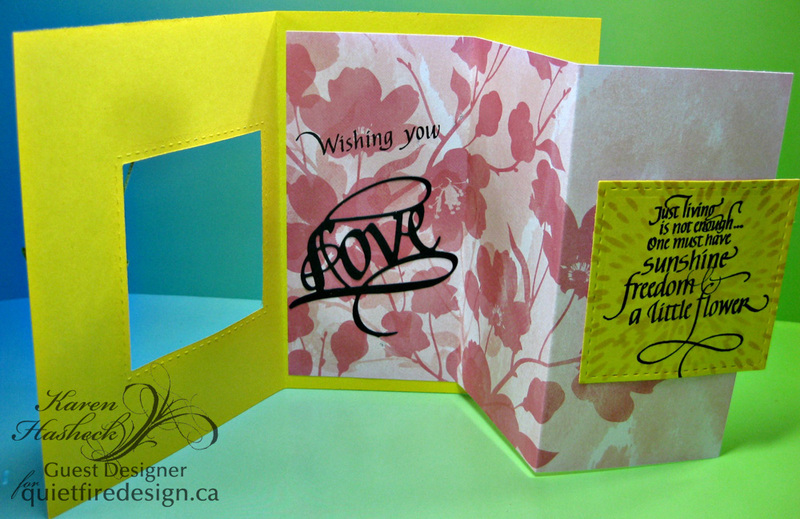 Attach the floral piece with adhesive only on the far left side of the folded designer paper to the inside of the card. 7. 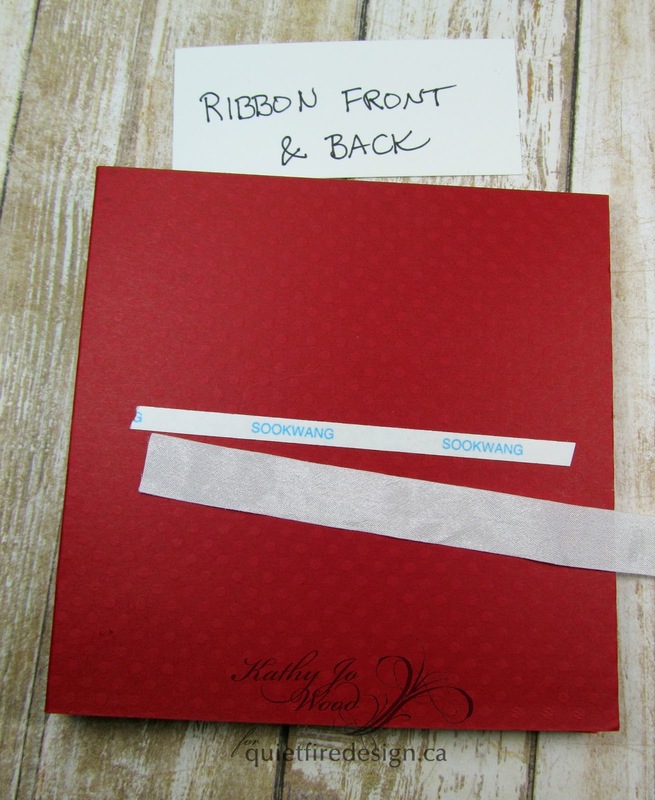 Fold the floral dp in thirds and from the front, attach the square sentiment piece so it fits perfectly in the square hole in the front. 8. Die cut Tim Holtz’s Wildflower out of green and pink cardstock, and attach the flower to the front of the card. I had so much fun playing with Quietfire Design’s gorgeous stamps and dies and hope you have enjoyed the cards I shared as a guest design team member here. [Thanks so much for joining us Karen and sharing your awesome projects! 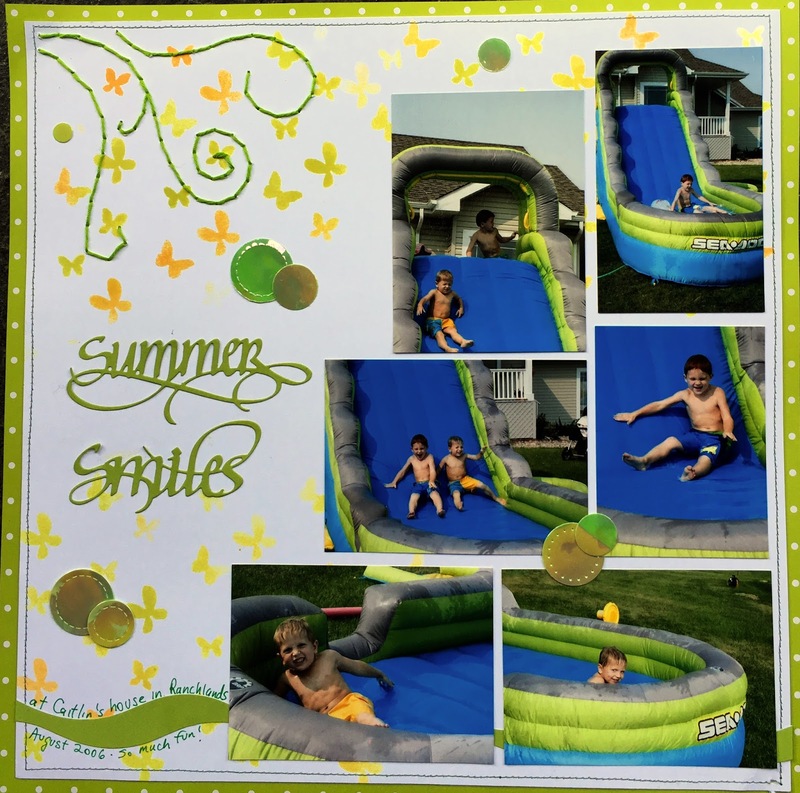 Hello, Connie Nichol here today with a summery scrapbook layout featuring two Quietfire Design Way with Words dies and the Butterfly Kaleidoscope stencil. This was a quick and easy layout - I followed (more or less) the July sketch from Creative Scrapbooker Magazine's sketchy gallery. 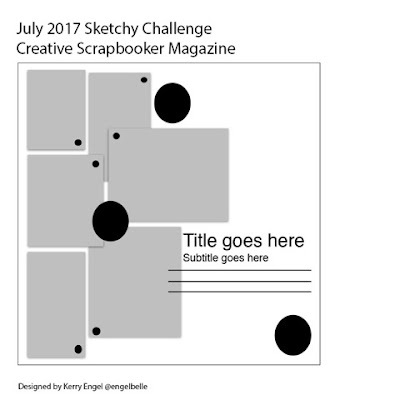 It's a great sketch to scrapbook six photos. For the background paper, I sponged two colours of Colorbox Chalk Ink through the butterfly stencil onto a piece of white cardstock. 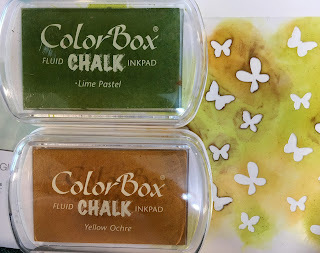 I love the chalk ink pads, they are nice and juicy and have such lovely colours and a soft finish. Just use a sponge applicator and dab on as much colour as you are in the mood for. Add the title - Summer (from the 4 Seasons Way with Words dies) and Sweet (from Sweet Smiles). 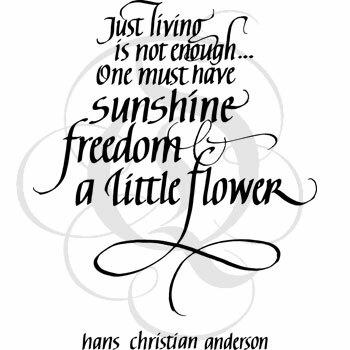 Then, it's just a matter of embellishing. I added some stitching (machine and hand) and some small circles die cut from an Elizabeth Craft Design shimmer sheet. 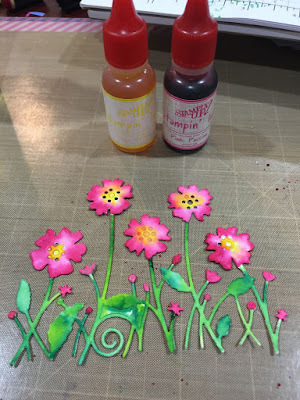 Quick and easy but bright and pretty! Hello! I wanted to try something new with something old. 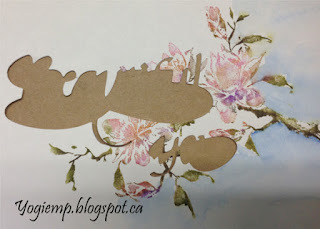 A friend recently gifted me with her Stampin' Up! reinkers and I must admit that it sat in a corner for a few months. I was inspired by Jeanine Dickson (@honeybopsdesigns on instagram) and her use of food coloring for her brush lettering. So it was just a little leap for me to try reinkers for watercoloring. I love the vibrant results! As you can see below, with just one application of coloring, I get bright results - much faster than with my watercolors. (And with the kids being home in the summer, I just don't have as much time to play and layer for colors.) The die I used is the Fairy Tale Flower Border die by Memory Box. 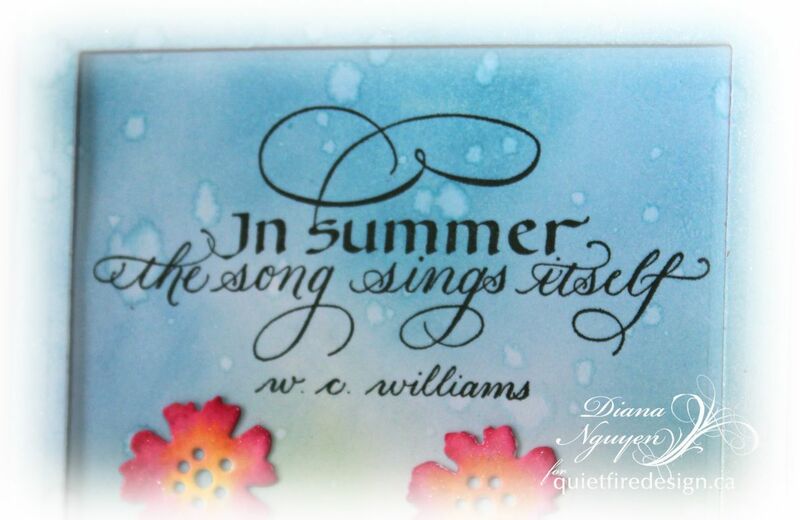 I sponged the background and added some water droplets before stamping this beautifully lettered quote. I wanted to frame it very subtly so i die cut a rectangle out of the piece and popped up the outerframe on a blue card base. I hope you like it and if you have some reinkers laying around, let me know if you tried this technique! 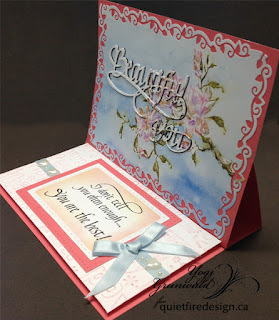 So to create this card you will need black cardstock and colors to coordinate with it. 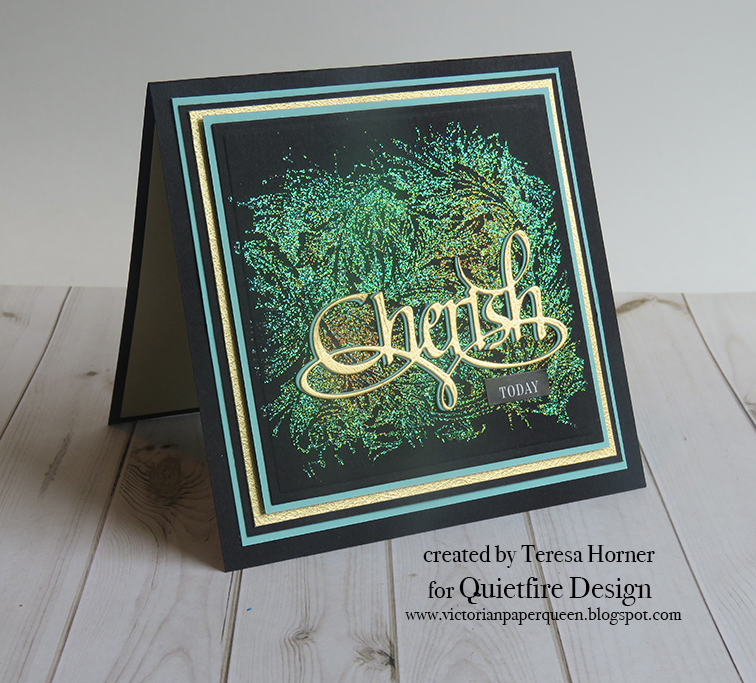 I used gold and turquoise to go with the embossing powder. 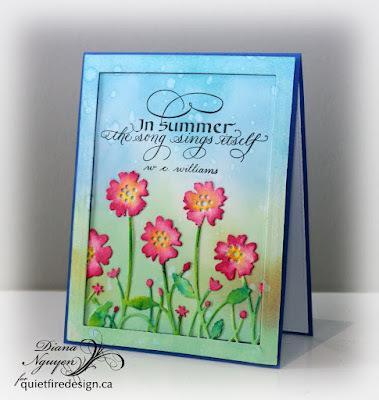 To try something new i stamped with versamark ink and then used kaleidoscope embossing powder on it. 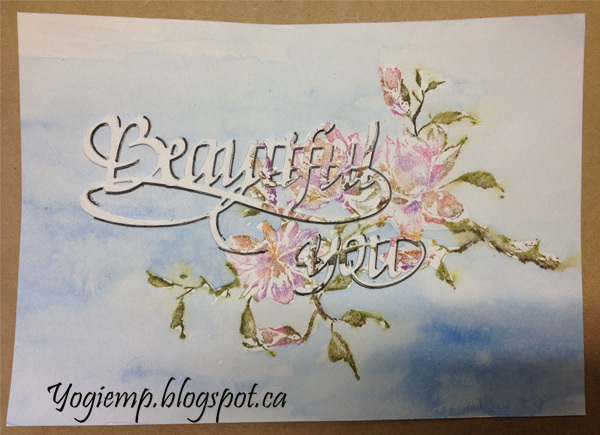 This created a fun muli-colored backround to put my gold die cut on. 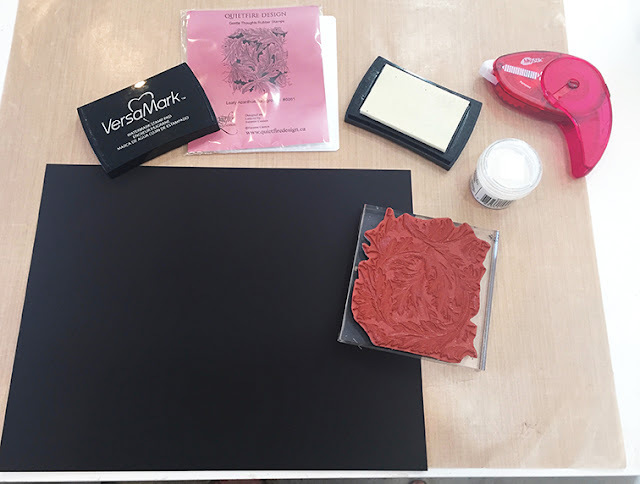 Start by stamping the ink on black card and then sprinkle the embossing powder on it and use a heat tool to set it. Cut around it to your desired size. 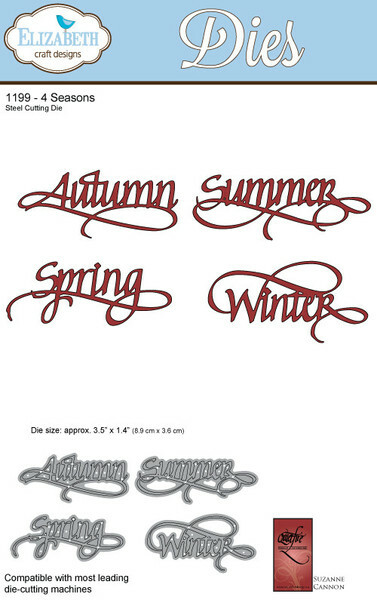 This is what the transition from not embossed to how the colors change. 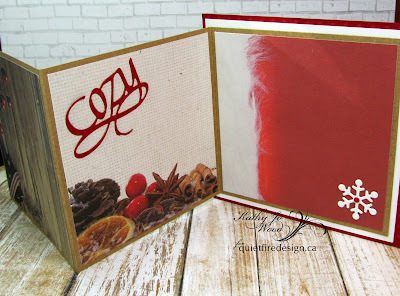 It's really fun and you never really get the same look because of the colors in the embossing powder. Dark paper is best but it will also work on colored papers. Once i matted the paper i went ahead and cut 2 pieces of the Cherish die. 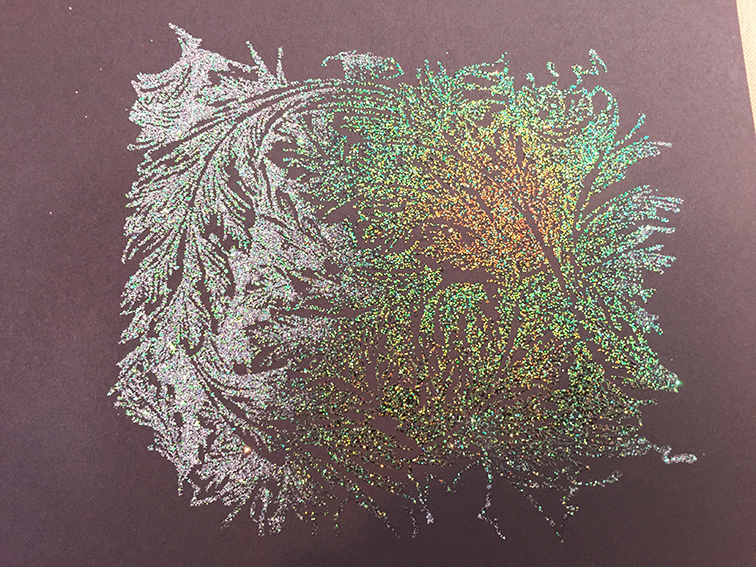 One in a soft muted gold and another in the turquoise that i use for the mat on the black. This made the die pop really nice. Then i used a fine line adhesive pen and glued it on my card. For the today i had a tiny word piece and glued that right under the die cut. Then i glued all of it together and to the card back to finish. 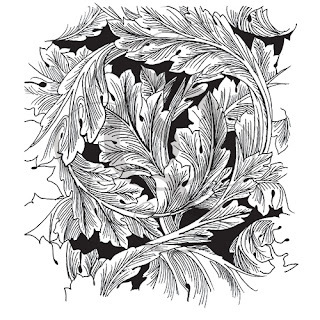 And here is a closeup of the LeafyAcanthus Backround stamp. It's beautiful and you can really use this for alot of different things. 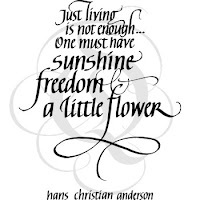 Be sure and stop by the store to check out all the new things this month HERE... you will love them. Thanks so much for stopping by and don't forget to pin us on Pinterest!! 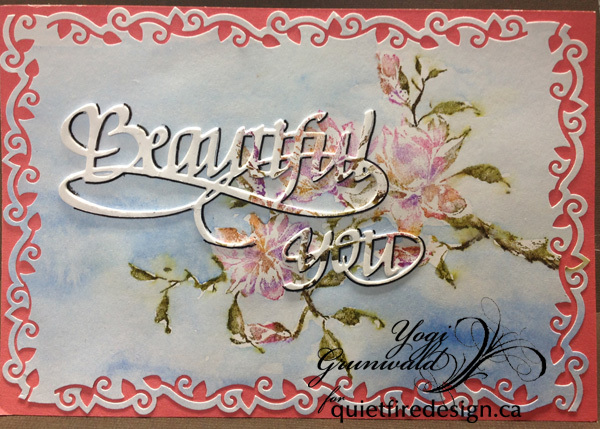 Yogi Here today with a stamped die cut technique. A Crafting friend pointed me to one of Jennifer McGuire's recent uTube videos - Stamping on die cuts, so I decided to try it right away. Scored and folded my pink toned cardstock to create the easel (7"w x 5"h easel closed). Cut another piece same size as front and adhered. 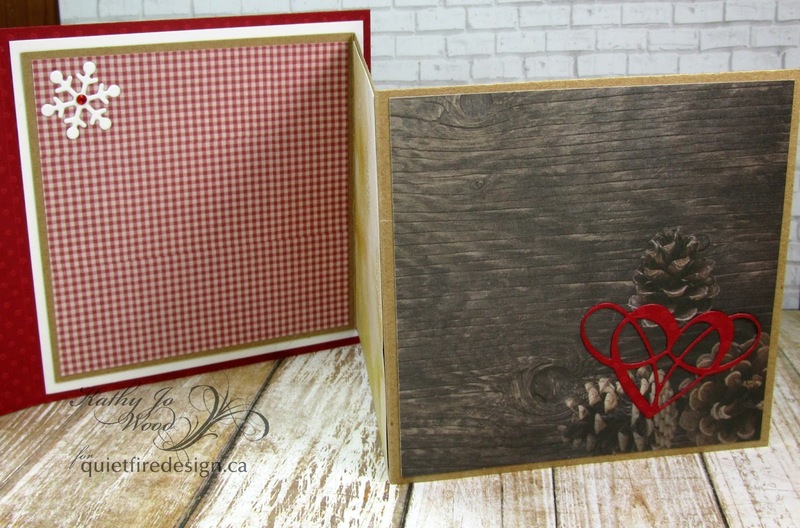 Created my stamped background and the stamped die cut layer (see pics and instructions below). 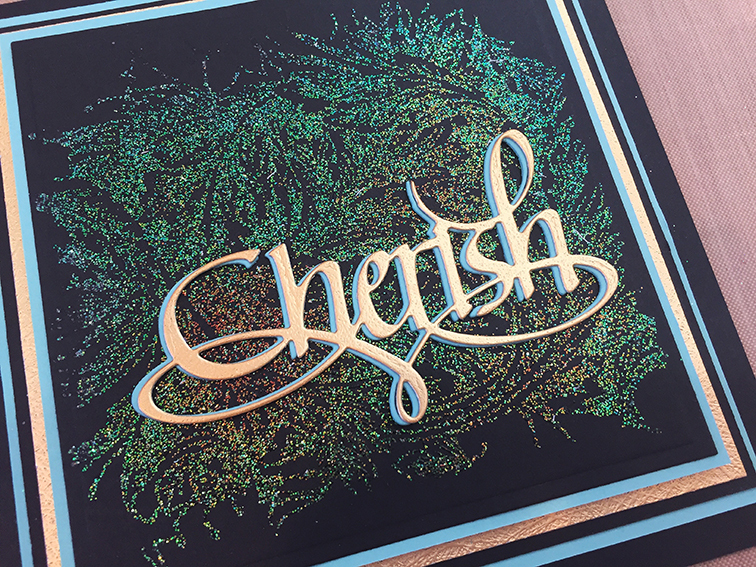 Trimmed down my background to 7"w x 5"h, then punched around the sides using an EK Success "English Ivy" border punch. I positioned the punch in the center of a side and worked the punch to the left and then to the right. Repeated on the opposite side. Then continued on the other 2 sides, stopping before it hit the edge. Manually trimmed down the corners. Adhered to front. 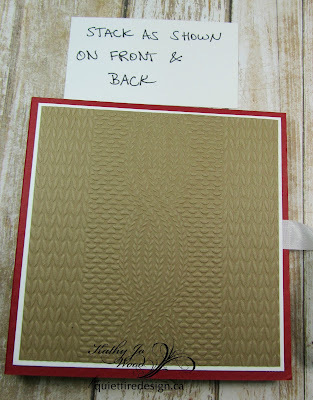 On the floor: Embossed a piece of white cardstock using the Cuttlebug "Happy Birthday" embossing folder. 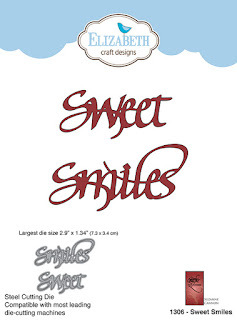 Hit the high points direct to paper with "Spun Sugar". Trimmed down to size. Stamped the sentiments on another piece of white cardstock using Versafine Black Onyx and clear embossed. Die cut it and the pink layer using Elizabeth Craft Designs "Stitched Rectangle" set. Adhered both layers together. 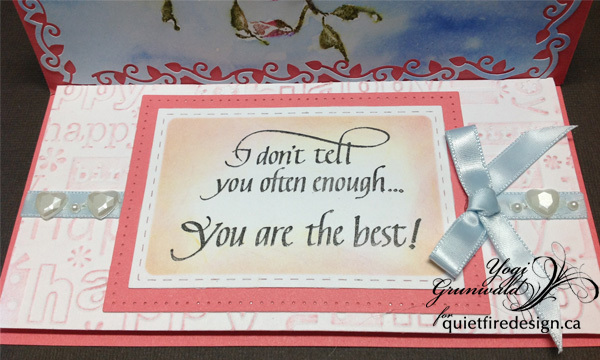 Adhered a piece of narrow blue satin ribbon to the Birthday embossed piece, then adhered the sentiment assembly. Adhered all this to the floor with 3D foam tape to act as my stopper. Tied a bow and adhered with hot glue. Adhered some heart/pearl rhinestone to the ribbon. 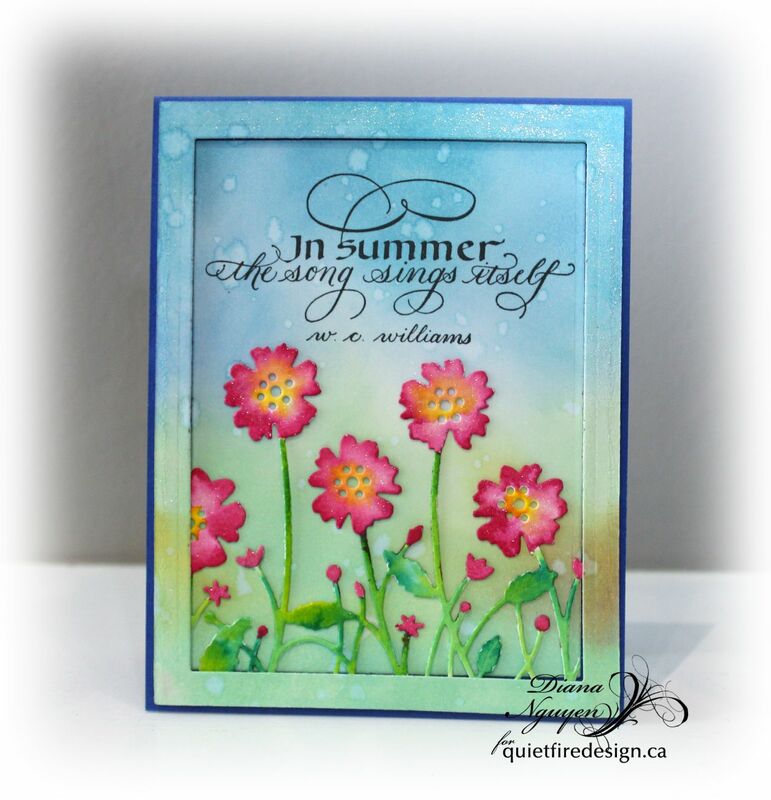 Using my Misti (so that I could register my images for the die cutting and assembly) and the Penny Black "Magnolia Rhapsody" stamp. 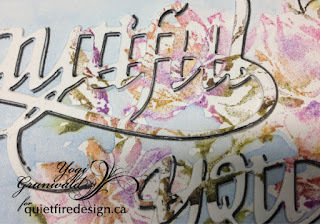 Inked the stamp using Distress mini pads - "Picked Raspberry" all over the flowers and buds, "Wilted Violet" flicked on the base of the flowers and buds, then hit here and there on the flowers and buds with "Fossilized Amber". 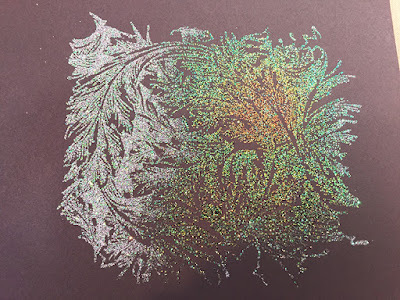 All over the leaves and branches with "Mowed Lawn", here and there on the leaves with "Forest Moss" and here and there on the branches with "Ground Espresso". 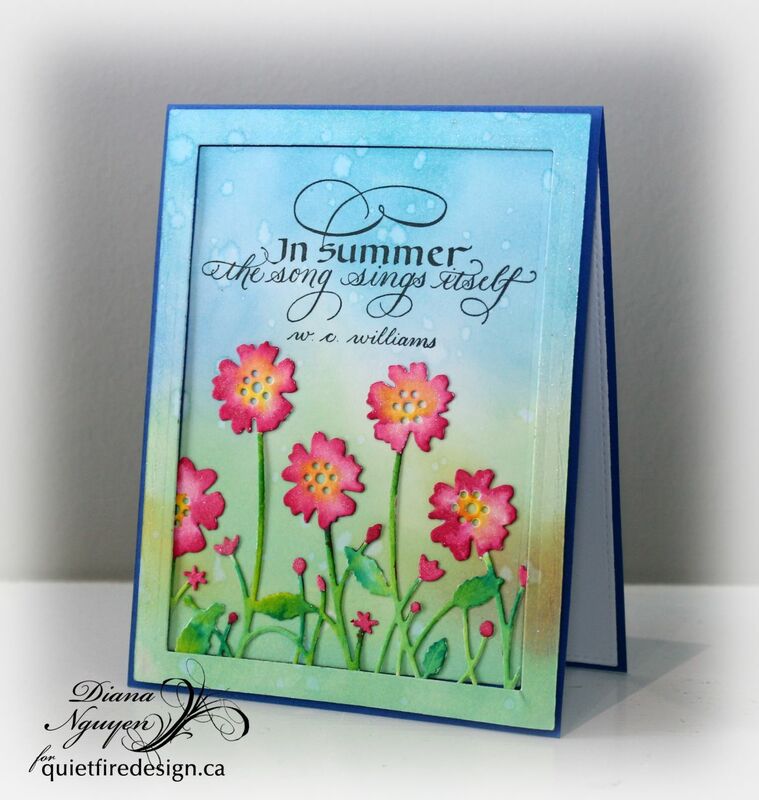 Misted with water and stamped onto white cardstock. Repeated the process to stamp on another piece of white cardstock. You'll notice that some of that image has the background colored... I experimented on it to pick my blue watercolor for the background. I filled a waterbrush with water and some of that blue color. Squeezed some out while painting around my stamped image to get a nice wet on wet technique. I also picked up some of the blue paint to add intensity is some areas, blending and moving the color around. 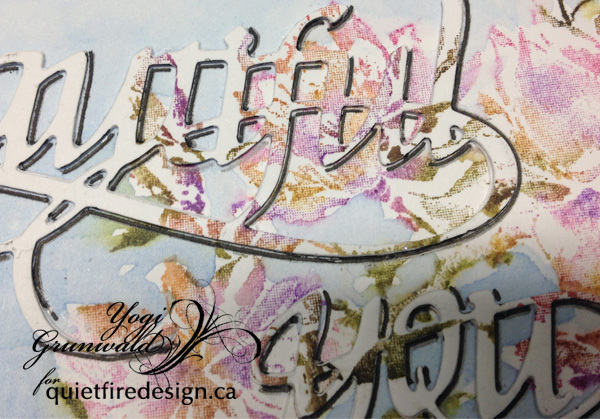 I purposely touched part of the stamped image which became activated with the wetness giving a diffused edge. Allowed my background to dry. I die cut 2 more layers of the words from white cardstock and adhered them to the stamped die cut (adds height to my words). 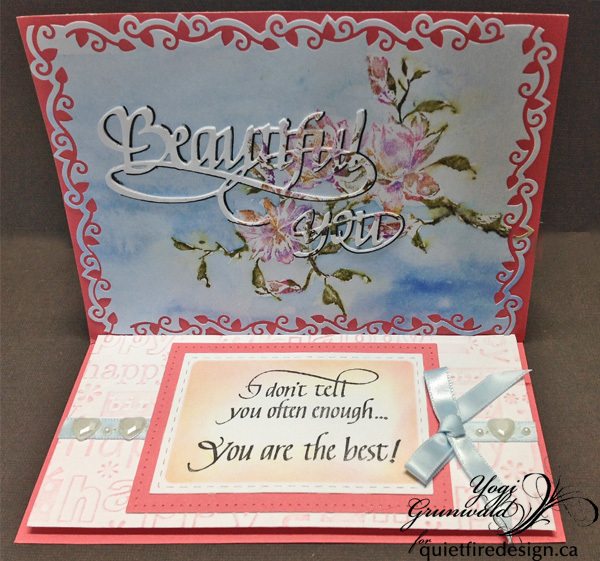 Used the negative die cut piece aligned with my painted background piece to position my die cut words to fall exactly on the correct area of the stamped image. Glued them down. 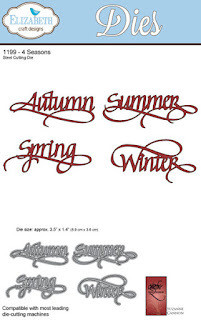 Used a pencil and then a Zig Writer to shadow the letters on the bottom and right side of each letter. For my project, I created a festive accordion mini-album using several Quietfire Design dies. 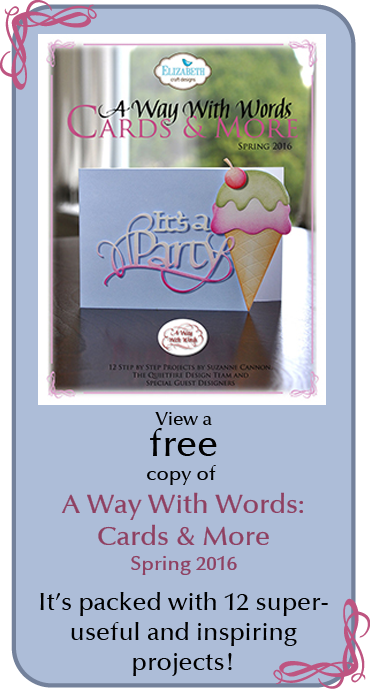 This mini-album can hold photos and heartwarming wishes to loved ones and friends. A lovely and thoughtful handmade gift! First, several goodies are needed for this project. The photo below shows most of the goodies. Die cut word dies and heart die in both red and white card stock. Die cut several snowflakes. Cut red card stock to 4 1/2 x 9 1/2. Score at 4 3/4 and at 5. 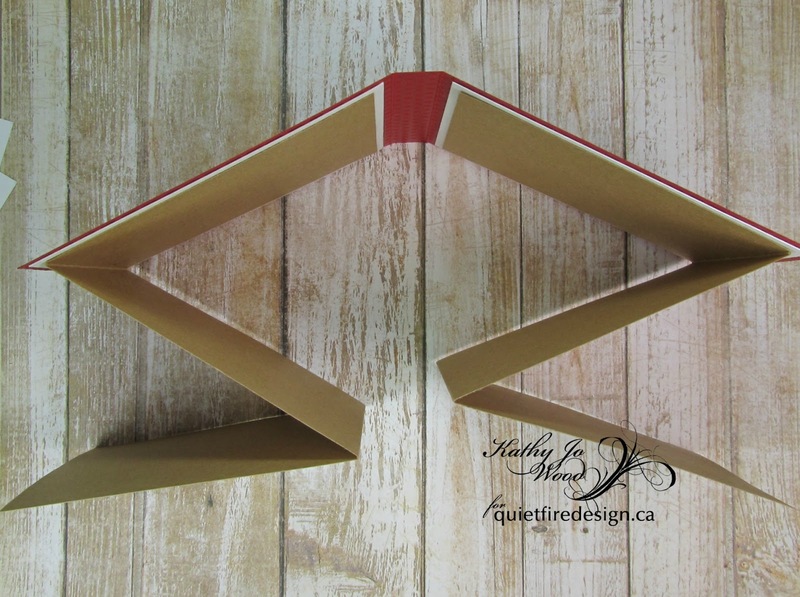 Cut two pieces of Kraft card stock to 4 x 12. Score at 4. 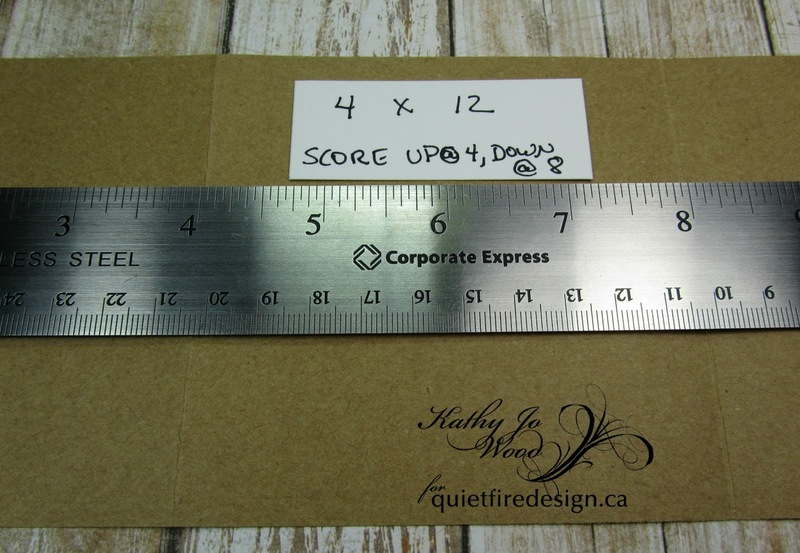 Flip card stock and score at 8. 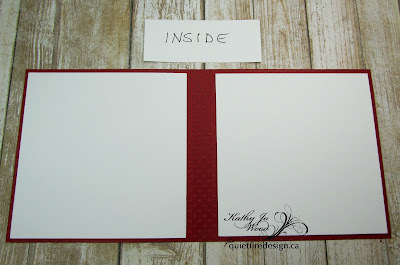 Adhere white card stock (cut to 4 1/4 x 4 1/4) to inside of album. 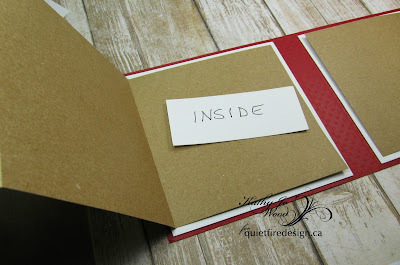 Adhere Kraft accordions to inside. The accordions should be mounted as shown below to ensure the accordions unfold properly. 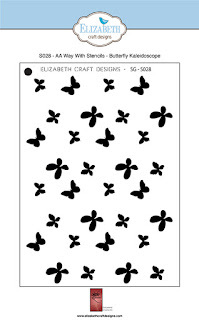 Adhere the patterned papers (ten required at 3 3/4 x 3 3/4). Adhere the snowflakes, Cozy and hearts as desired. Below are several photos. 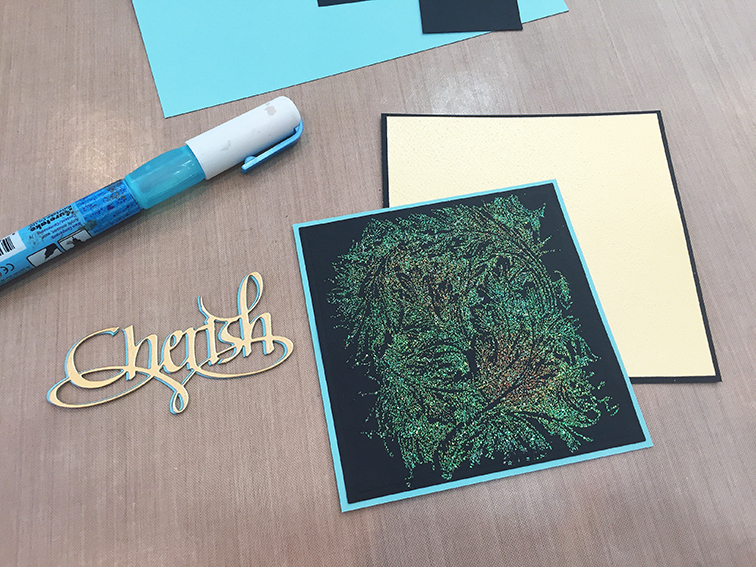 I made sure to also use a couple of patterned papers that were not "busy" so that I could write in the open areas. Now we move to the outside of the album. Use good double sided tape across the middle of the album front and back. Do not go to the edges as the stacked card stock (in step 8) leaves an open border around the album front and back. 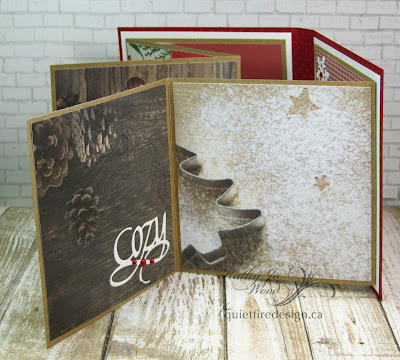 Assemble white card stock (4 1/4 x 4 1/4) and embossed Kraft card stock (4 1/8 x 4 1/8) to album front and back. 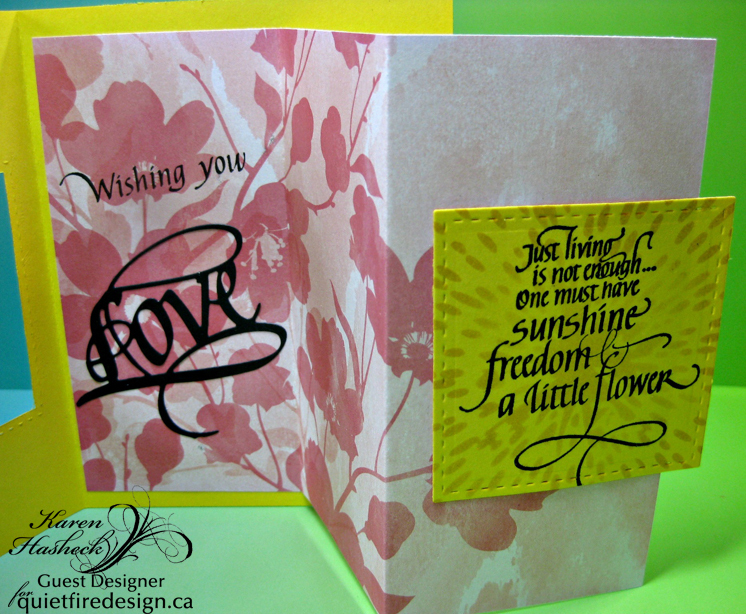 Adhere (using liquid adhesive) the red and white "Warm Thoughts" die cuts to the front. Add snowflakes. Add gems. Tie bow. Thank you for stopping by! 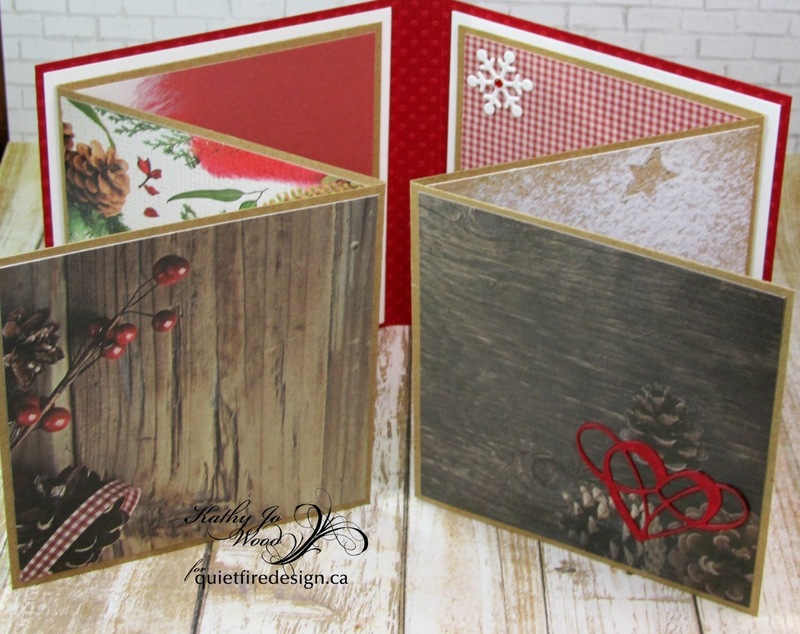 I do hope you enjoyed the tutorial and don't forget to check out the Christmas Specials at Quietfire Design! 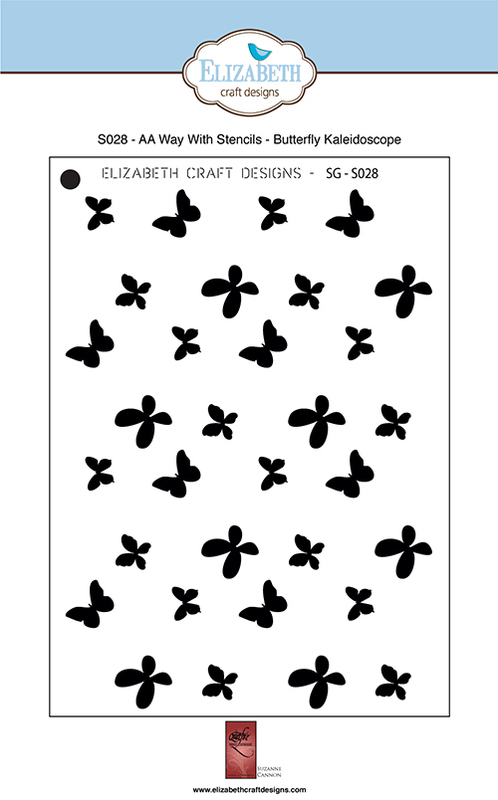 This month’s Designer Challenge for the Elizabeth Craft Design Designers is to choose a technique from Els’ Technique Friday videos and use it in a project! I’ve chosen Coloring on Soft Finish Cardstock, a tutorial from over a year ago, but a timeless technique. You may view Els' video tutorial HERE. Soft Finish Cardstock has a pebbled surface that is just perfect for creating beautiful color blends. I must give a nod to Anita Izendoorn who is the master of this technique! 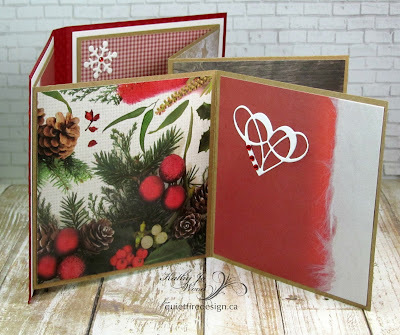 I had a card all planned out and then realized this was going on the Quietfire Creations blog, so did a quick shift to a Christmas theme to match our Christmas in July weeks! 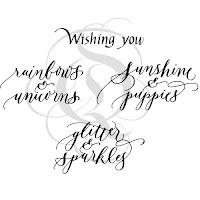 Here is what you will need to make this card! It seems like a long list, but I'll be you already have a lot of it! 1. 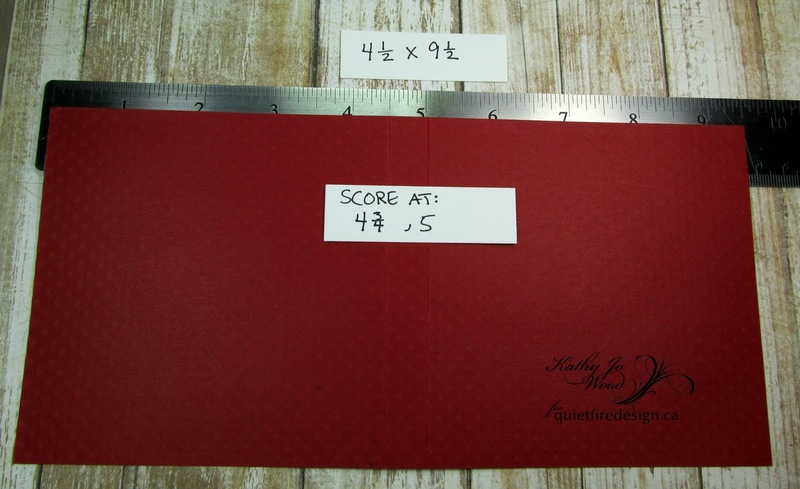 Form a 7 x 5.5” tent-fold card base with red cardstock. 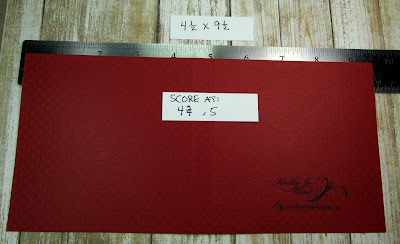 Cut a rectangular panel from white cardstock measuring about 7 x 6". 2. 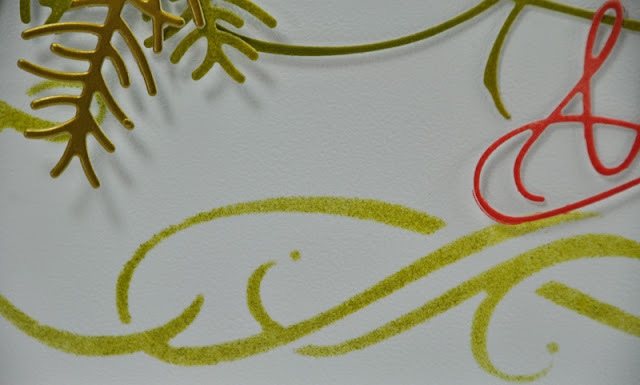 Use removable tape to hold Flourished Frame stencil on white panel and sponge Crushed Olive ink through all parts of the stencil, but more lightly along the top edge. Sponge Peeled Paint on only the bottom half of the stencil. Apply colour by first patting with the blending tool and then use small circular motions. Be careful not to move the stencil while you're sponging! Remove the stencil and allow to dry. 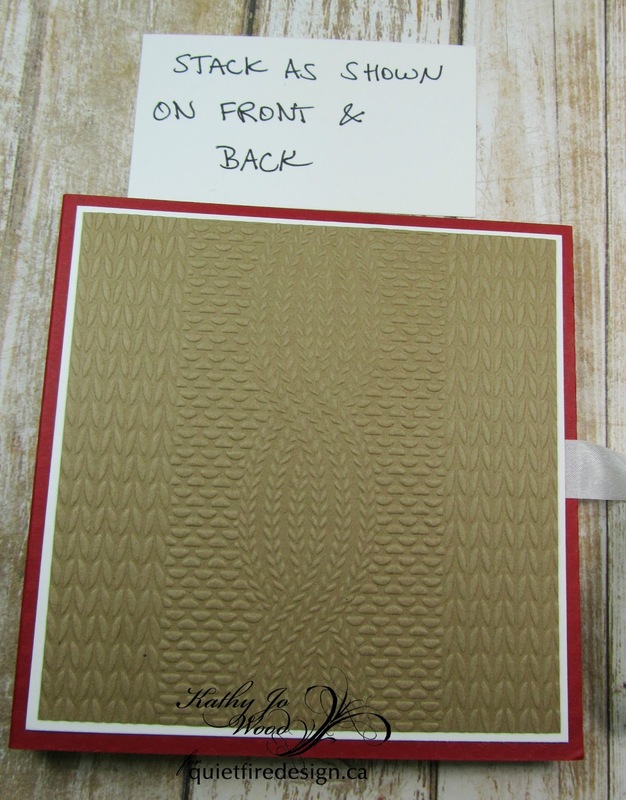 Trim to 6.25 x 4.5” and mat with olive cardstock. 3. Die cut Christmas (from Merry Christmas 2), Love (from Baby Love) and Sprig with Berries from white cardstock and gold cardstock. Sponge Barn Door ink on love and berries. 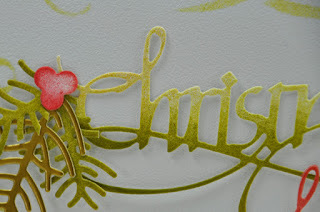 Sponge Crushed Olive all over Christmas diecut, but less colour on the top half. 4. Sponge Crushed Olive on only the bottom half of Christmas. 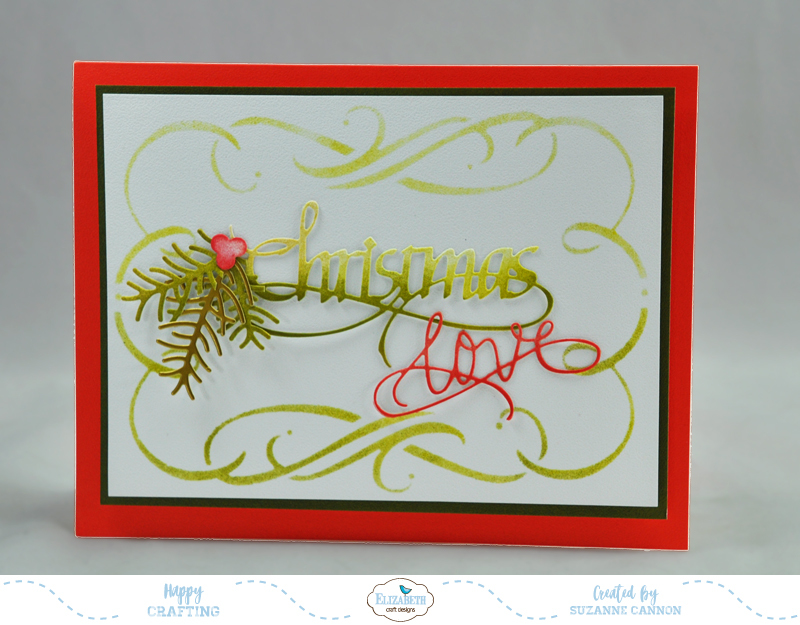 Designer Tip: By applying the colours this way it will appear as though the card is being lit from above. 5. Adhere Christmas with rolled bits of Clear Double Sided tape as shown in photo. Adhere Love with glue. 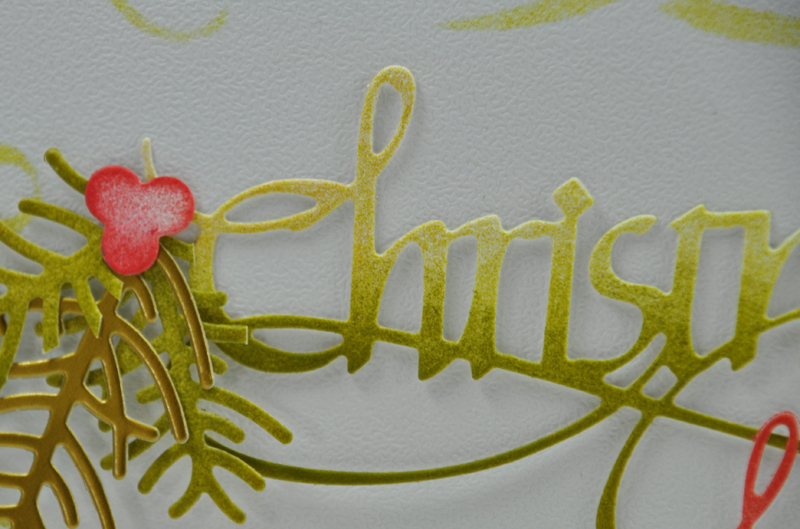 Trim bits from the Sprig and adhere to card with berries. 6. Layer panels onto the card base with foam tape. I hope this has started your creative ideas flowing. I just love the Soft Finish Cardstock - you should try it! Christmas in July: Let it Snow!